Homes and landscapes often hold memories of families and their histories. For this specific LanaiScapes project, a client’s family history was integrated into the landscape of the yard. The client’s grandfather was a flower farmer, and the client wanted to keep that memory alive by planting the same plants his grandfather did, which included orchids and ferns. 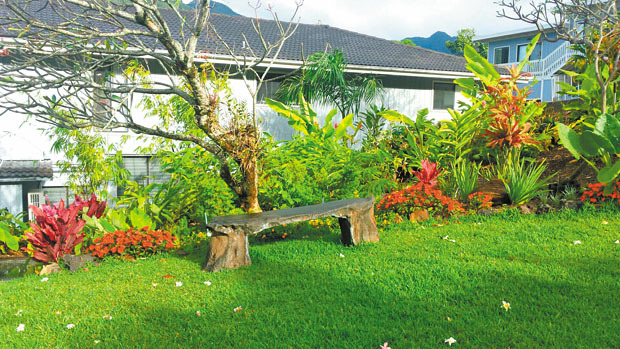 Two terraces in the back would soon be filled with plumerias, orchids, gardenias and white and torch gingers. These flowers make the landscape fragrant and relaxing, while also reminding the client of his roots. To start this project, foliage was removed from the landscape. Matured ti leaves, plumeria trees and crotons were kept as a base for what was to come. Plumeria trees have a particular smell that can remind anyone of home on the Islands. This is an example of how one’s sense of smell can evoke the strongest memories. Keeping fragrance in mind when it comes to remodeling is a big factor in how you will experience the area, and ultimately, your time living in your home. It is an important part of how you will perceive your space — even if you love how it looks, you want to keep all of the senses in mind. Intimacy was an important factor in the client’s mind, while still maintaining enough space to entertain guests. The tropical plants added on the terraces and around the rest of the home, such as ornamental bananas and torch gingers, accentuated privacy. 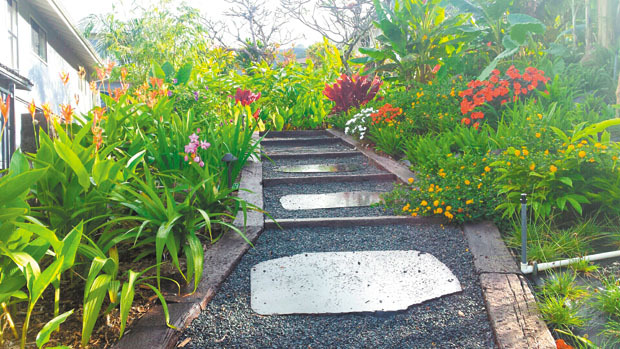 The bright colors of the flowering plants made the landscape feel welcoming and energizing. A French drainage system was integrated into the landscape to allow excess water to filter out and off the property. This keeps the rainwater from flooding the landscape and ultimately destroying the atmosphere. The client was enthusiastic about the changes being made to his landscape. When memories can somehow be incorporated, it makes that part of the home richer and more meaningful. Being part of that was an invigorating experience for the designer. The client’s yard currently has a fantastic view of the landscape and surrounding area that evokes a happy and relaxing atmosphere. The purpose of the landscaping job was to change the way the yard looked, and to turn it into an intimate, entertaining space. This goal was achieved by creating a story with plants surrounding the home, and by evoking memories with the presence of orchids. • Have a system intact to get rid of excess water. • Consider the history of the property. • Sense of smell is a sense often forgotten; let it change the perspective of your space by making your landscape fragrant with flowers and nature.